I am finally getting around to writing up the progress on making my first USB device. I can finally say that I am finished, though as any maker will know there are a ton of things that I would like to fix or improve. At this point it is attached to my desk and it has been working perfectly for the last month. I am pretty proud and it fits into the overall design just like I had hoped. MBB v01 in the bottom left. I am not fast at this. I am not slow, according to some definitions of slow, but I am certainly not fast. I am going to take a moment to pull everything together and go through the process so that in case it helps others but first I want to give a huge shout-out to @Troll who was patient and helpful throughout the whole process. Without him this would have been a longer process and I would likely not have finished. Any likes attached to this post go his way. After a good friend of mine (thanks Danny!) 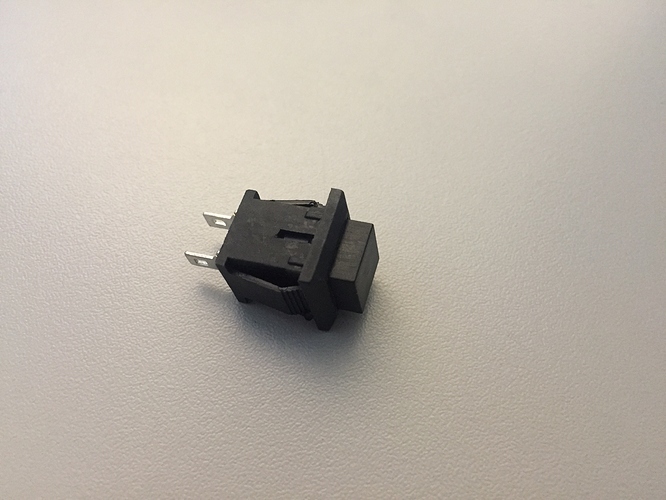 received his Prusa Mk3 3D Printer, I felt the inspiration to start down the path to building my own USB device. I had been throwing ideas around in my head for 20+ years. It started with Falcon 4 and wanting to make my own MFD devices but thanks to Thrustmaster and CH Products making devices that could do what I wanted, I didn’t have to those. I never stopped thinking about it, running through design ideas like a mental exercise. I had been flying around in the DCS M2000C by RazBam and struggled to deal with the radios. 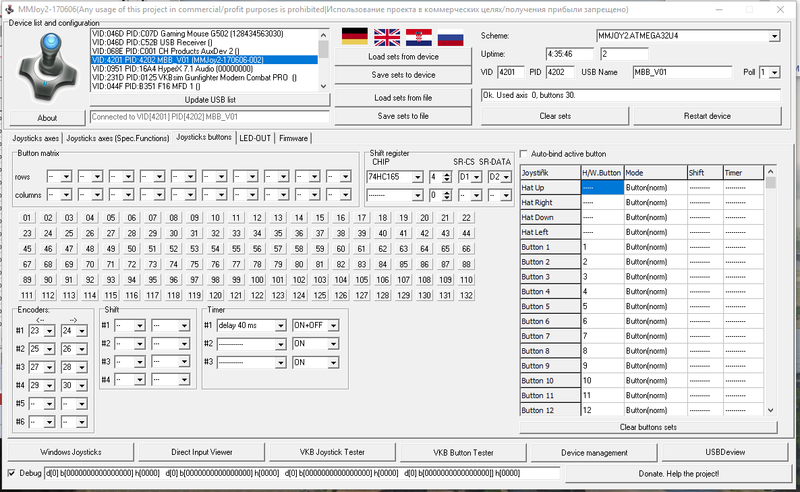 I, somehow, didn’t have enough buttons in front of me to adequately map the radio device functions and using the mouse to hit them while trying to fly the virtual aircraft was am exercise in frustration. In the Mirage they are located a little forward on the left and they can be a little tedious to access with a right handed mouse while trying to fly with my left hand on the stick. 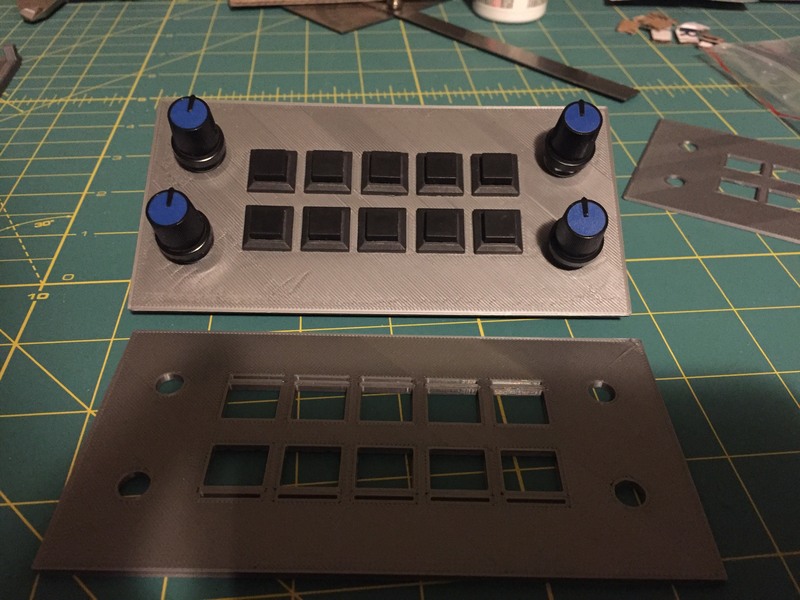 Enter the 3D Printer + @Troll’s custom hardware posts. Inspiration arrived. All three of these are fairly critical early on because, together, they will give you the starting points for the size and dimensions of the design. 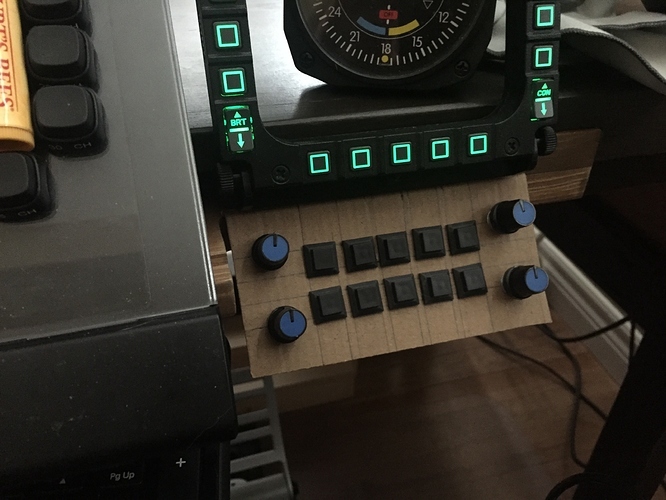 I wanted a panel that I could devote to communications for various modules in DCS and X-Plane. It could even double as a navigation panel in a pinch. I wanted a panel that could attach to my desk, hanging under it and sitting forward to be within easy reach. 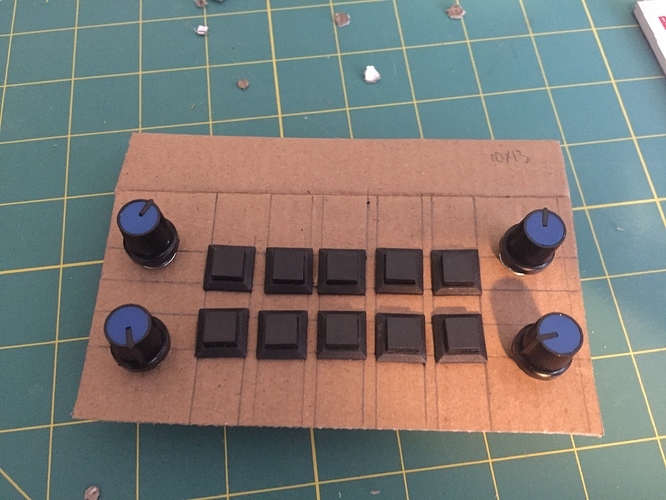 I wanted a panel with a set of rotary encoders, a couple of toggle switches and some pushbuttons that could act as up/down actions for the radio thumb-wheel encoders (that I could not find anywhere I looked). I wanted a panel that could do that in a relatively small space, right above my left knee in my cockpit layout. These little chaps where the beginning. As Adam Savage always states: “Failure is always an option”. That is true in literally every project and you need to embrace it. It is the fundamental way we learn. What you want to do is fail early and fail often. That’s going to allow you to adapt and think through your problems quickly and cheaply. To tackle the layout problem, after I had ordered some parts, and disassembled a few boxes to allow we to prototype the design. This was simple and let me hold and handle the parts and layout in the real world. It let me see some of the challenges that I was about to face and let me make mistakes when measuring that I would carry forward. It let me place the design and figure out where it is going to live. It let me teset the design early without having to commit to a box and having to ‘destroy’ that box to learn from my early mistakes. It let me check to see if the left side is where I actually wanted it, or if it could go on top of the desk, or anywhere else. The above picture is on the right side (above my right knee) but this is where I have my keyboard and there was no where else that the keyboard could exist. This is where I spent the majority of the year - designing and redesigning the box. It became a time sink in that I was always improving the design, changing how I approached and solved the problem. I started with the front panel - which went through more redesigns that I can accurately describe. I made a ton of mistakes here, which was not as frustrating as it may sound because it gave me an excuse to go back to the drawing board and try it again. 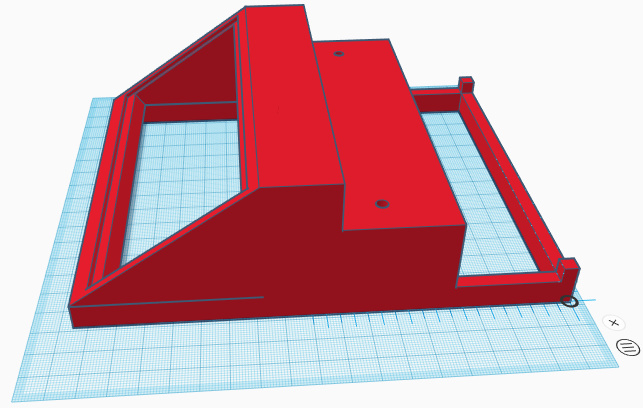 While iterating through those designs, I was also tackling the problem of how to mount the switch panel to the desk. 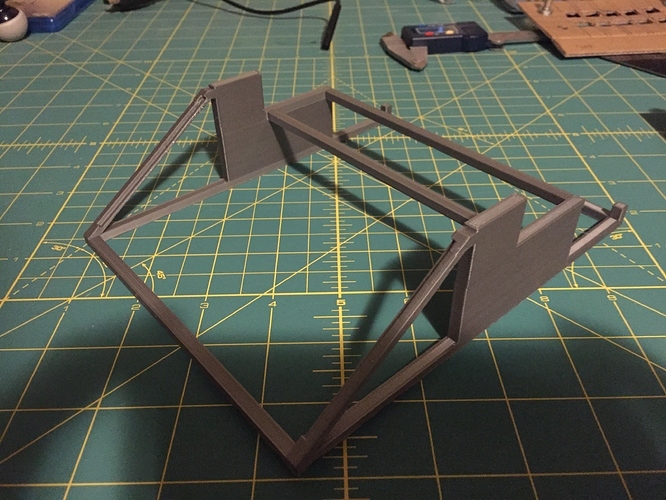 I started by measuring the profile of the desk (and the structure that sits underneath my desk), turned that profile into a 3D print and added some simple bars to allow me to check the fit. In addition to all of that, the switch panel had to be mountable to the front of the box. That meant that it needed a place that it could screw into. I ended up creating a bracket that would fit inside the ‘mouth’ of the box that switch panel could be screwed in to. 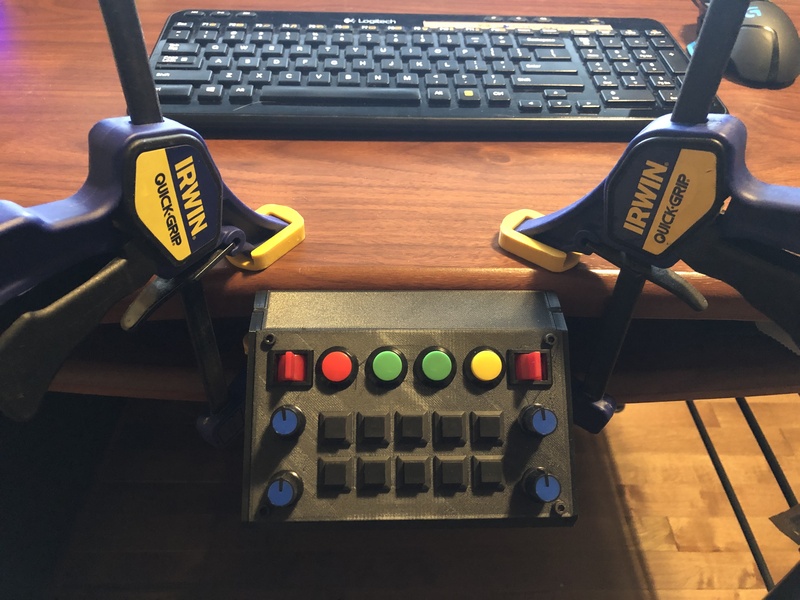 And that had to match the rotation of the switch panel, yet sit far enough back from the panel to allow it to be somewhat recessed into the box. It would get simpler, and more complex, that this as time went on. 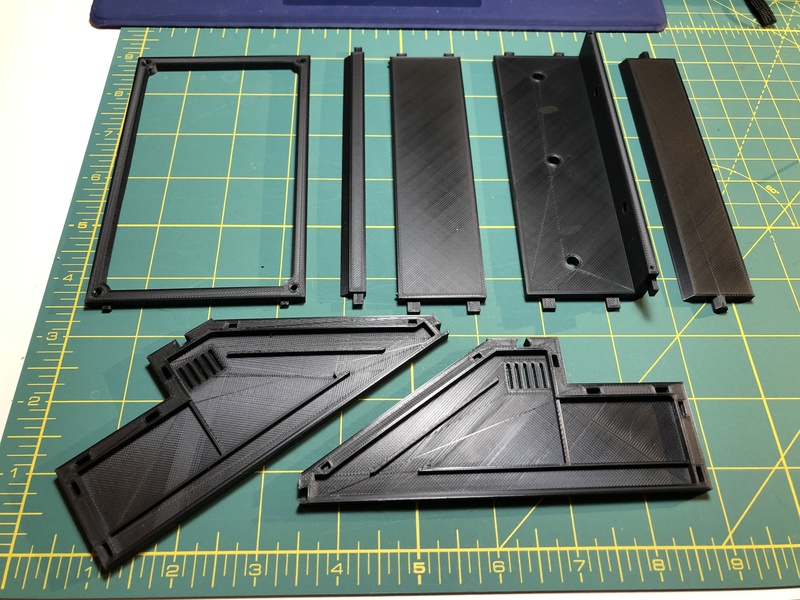 In order to get past the thermal warping issues I decided to split the box up into panels that I could glue together. I also dropped my attempt to print this in ABS because I realized that there was no real point. 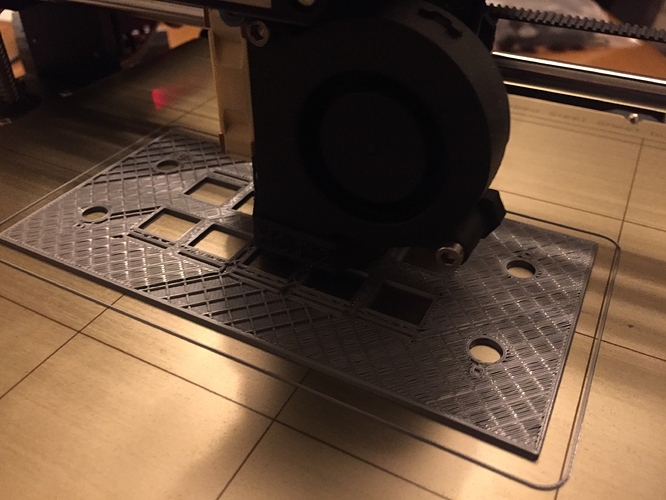 PLA+ was good enough and easier to handle on the printer. At this point I realized that I had another issue: the box wasn’t long enough. 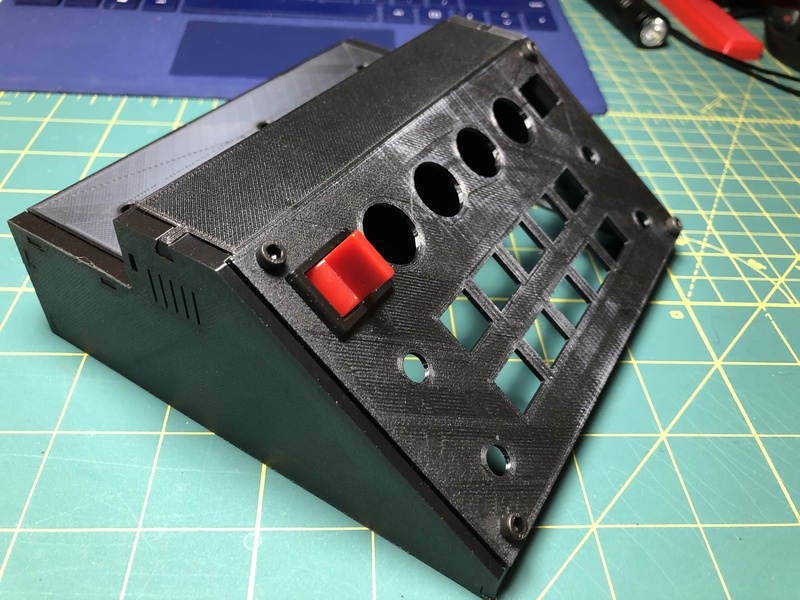 Since I had started this project, I had also started a project to put small LCD screens under my Thrustmaster MFDs. 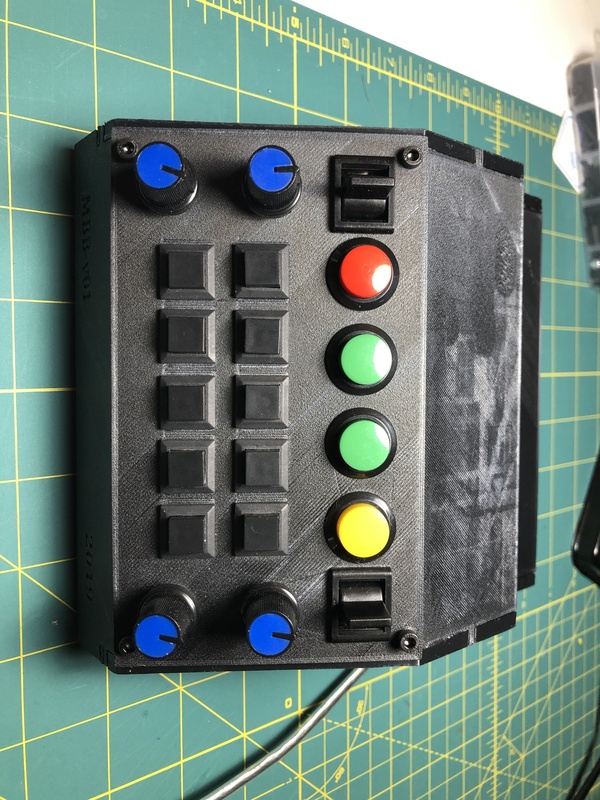 That pushed the MFDs out from the front of the desk by a few centimetres, meaning that the button box was going to see too far back, underneath the MFDs and the top row of buttons was going to be unreachable. 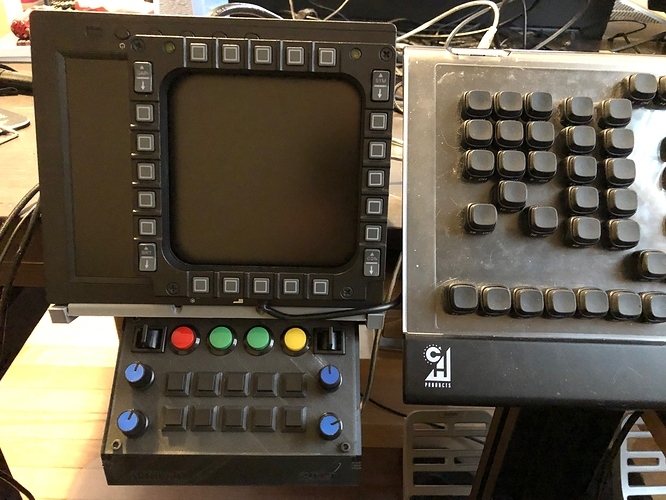 If you refer to the first picture in this post, you can see how the extended length of the box allowed the buttons to just become visible, and useful, without putting them too far forward and causing the box to move/bend/warp when the buttons are pressed. By splitting the box up into panels I had, inadvertently, made it easier to fix this problem - only having to rebuild a few pieces of the box instead of the entire thing. One thing that I have not touched on yet is the bottom of the box. It needed to hold the electronics and be detachable from the bottom for ‘maintenance’ and assembly. 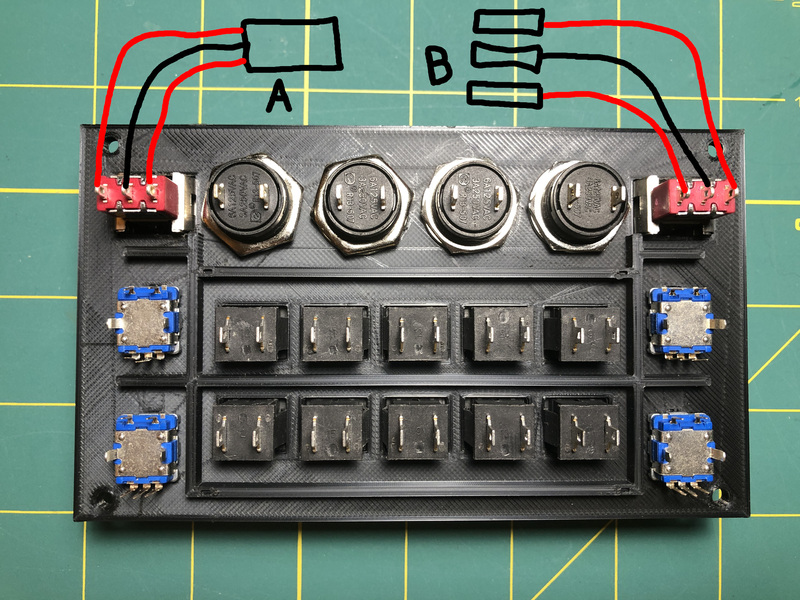 Given the experience with the switch panel above, this a simpler problem to manage as it could be a simple plate with stand-offs to mount the PCBs to. 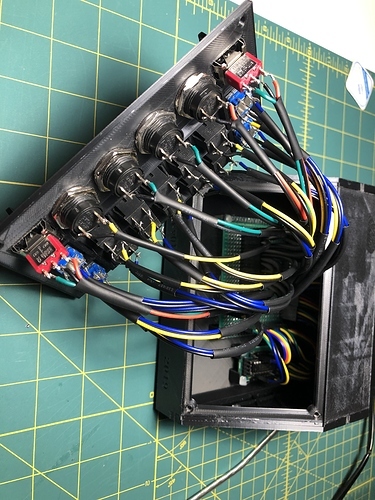 Before I wanted to tackle the wiring, I wanted to understand how the system was going to work from an electrical-to-software standpoint. 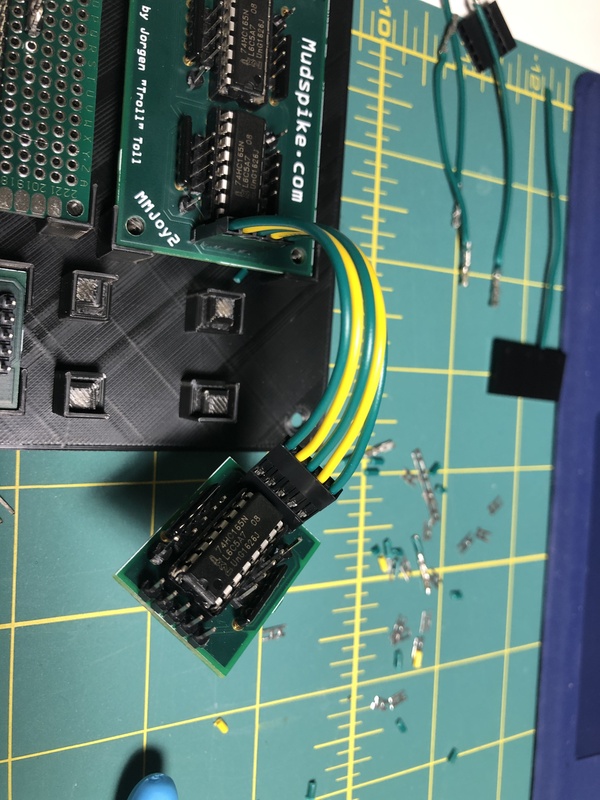 I wanted to figure out what challenges that I would have to handle on the software side before I had implemented a wiring pattern that I might seriously regret later. 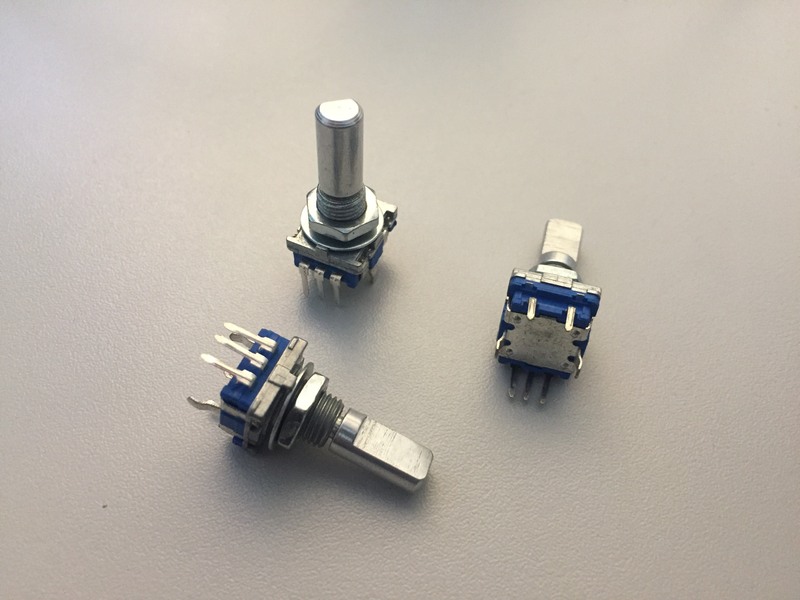 The first switch that I wanted to look at was the more complicated of the switches: the rotary encoder. Other momentary pushbuttons seemed fairly straightforward but that one might give trouble. 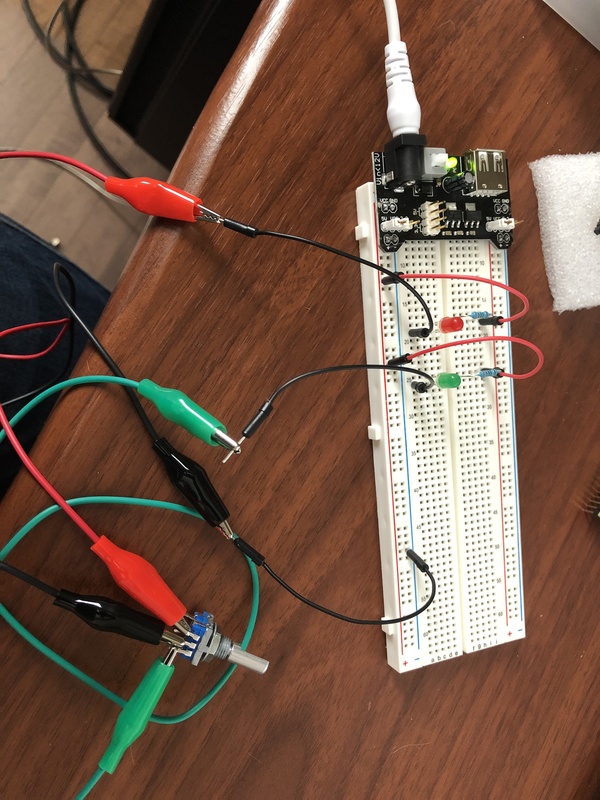 I wired up a test to take a look at how the switch responded. And that was … weird. 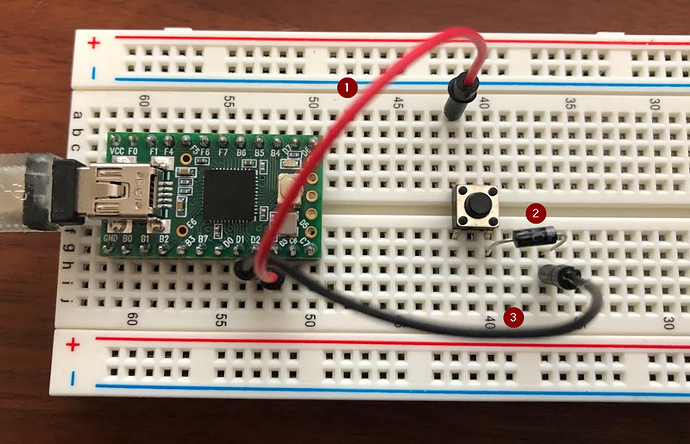 I expected it to be simpler and act as a push button in each direction but it was more complicated than that - because the mechanics of the switch need to handle rotating in either direction. What happened when you turn the switch through one ‘tick’ (the physical barrier you feel when you turn the switch (so there are 20 ticks around a full 360 degree turn of the switch)) is that both lights would flash. What? Yeah, both. But if you slow it down and mechanically move it into, through and out of the tick, you can see what happened - it generated a ‘pulse’ as you enter the position and a ‘pulse’ when you come off the position. If you rotated the switch really slow, then you could hold it as it was part way through one of those ticks and you saw this. So as you entered the tick, one led would flash and as you left the tick the other one would flash. And that caused me to panic because how the heck do yo solve that in hardware? 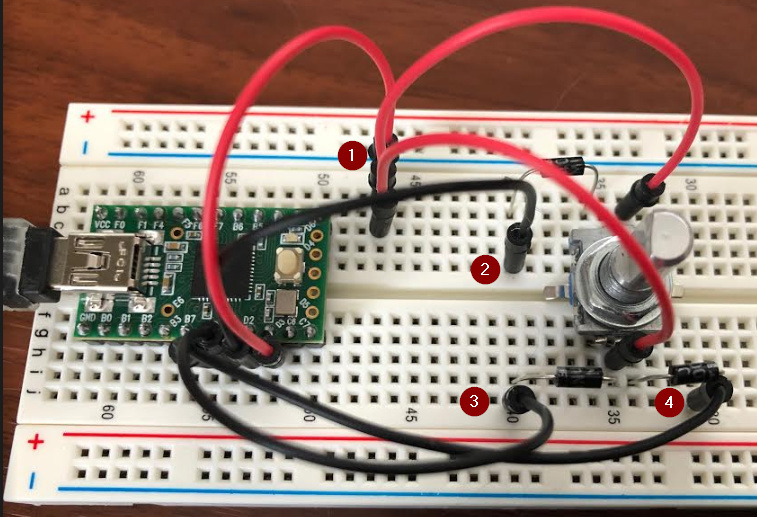 This rotary encoder (not sure if that is the correct name as it often returns different result from Google searches - may be called a mechanical encoder) turns clockwise, counter-clockwise and has a push-button action when a force is applied downwards on the shaft. Mouser.ca link t a similar device: here. 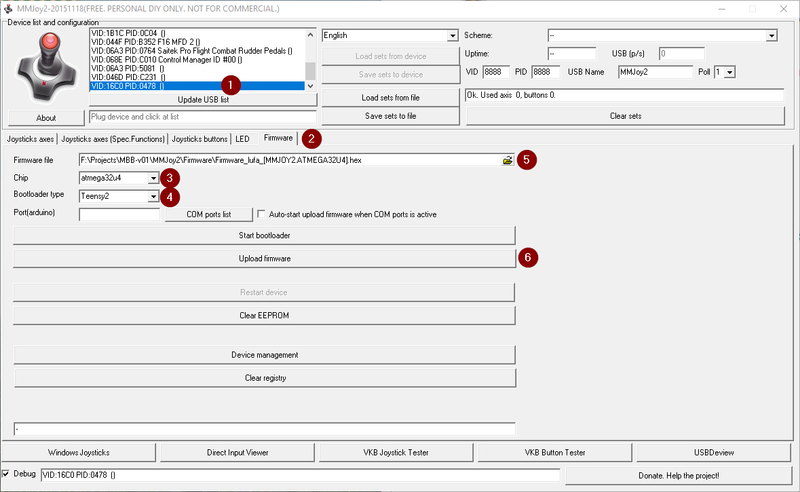 c. (2) Make sure that the Show log checkbox is selected. 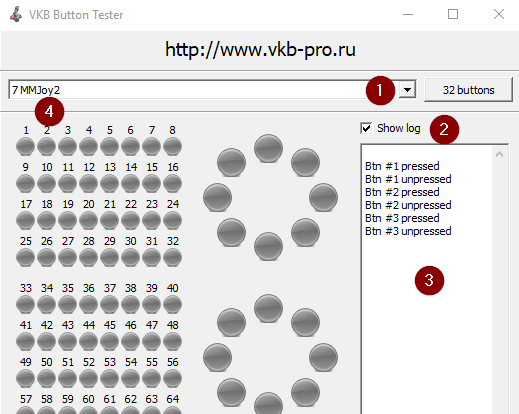 e. (4) Press your buttons and check for the results in the (3) log - in my case the button presses occur to fast for the VKB app to flash the corresponding light and this caused me to think that things were not working for some time. Once the log was enabled, you can accurately see with is being sent from the Teensy device. 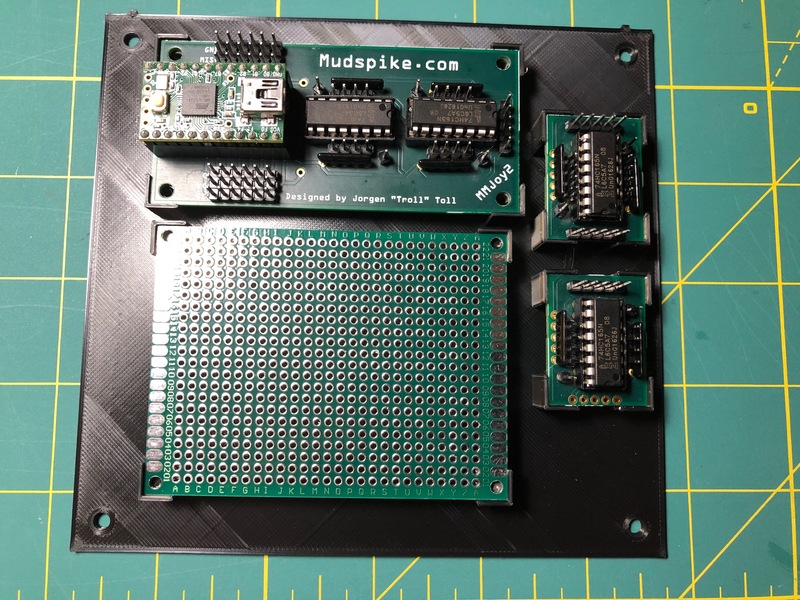 @Troll was kind enough to send me a Teensy board mounted to a shift register board that be had built with an additional 2 expansion shift register boards. 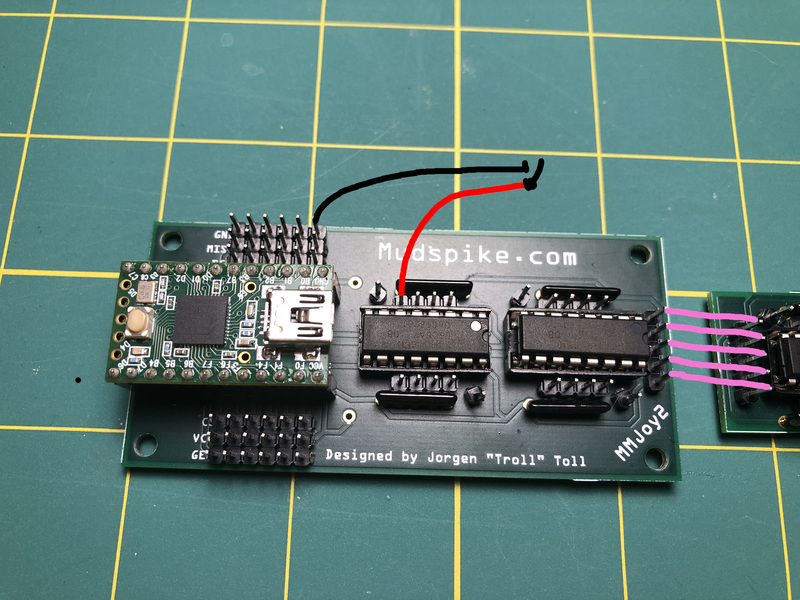 I originally anticipated using something like the blank PCB above but the boards provided by @Troll meant that I could focus my time on other things and, in the end the project did not spiral down into a long, drawn out attempt to recreate those boards with solder, wires and elbow grease. I think that I spent so much time with the 3D print design that I was, unconsciously avoiding getting to that phase of the project. 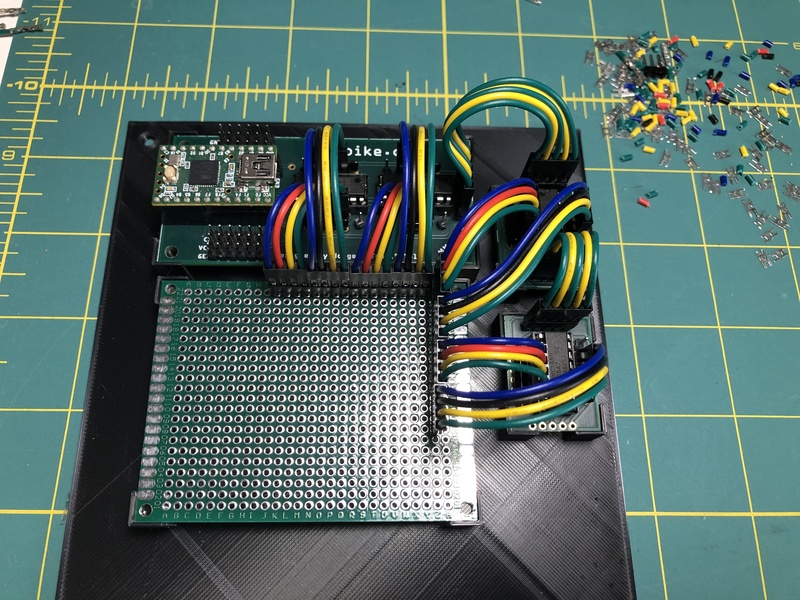 Looking back on it, I underestimated the time that would have been required to do the electronics without those boards. 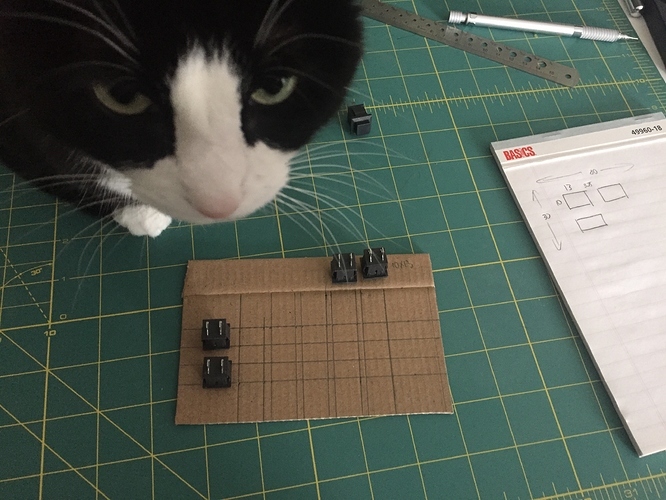 I would argue that the box design would have had to change as well to be able to incorporate enough space for me to do what those 3 boards to so efficiently. Yeah. I don’t want to go there. 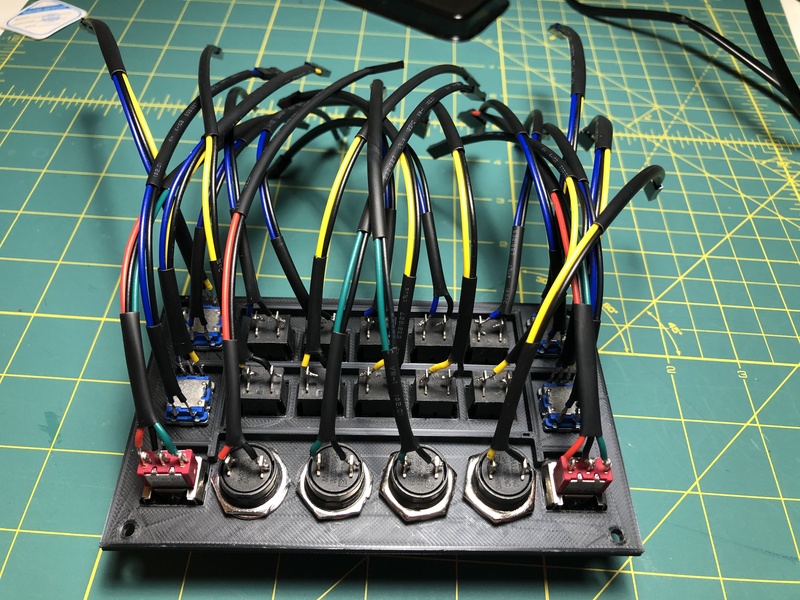 On the electrical side, the first task was ti figure out how I was going to wire up all of those switches to the pins on the PCBs. 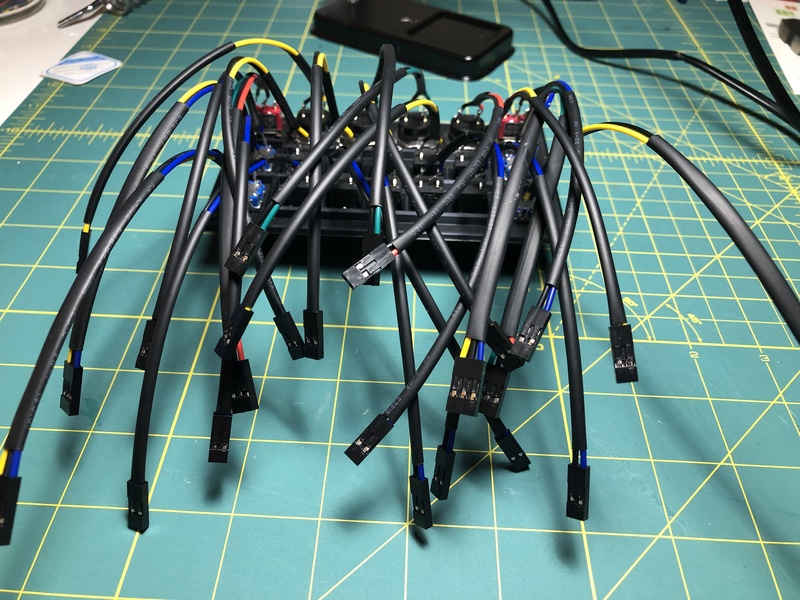 I could mount them directly, using option B above - which meant that they each had to have Dupont connectors on each of the wires. Or I could mount them in sets to a ‘break out’ board that would ‘map’ to the PCBs, option A. It would mean ‘less work’ but ‘more chaos’ inside the box and I think that troubleshooting would have been a nightmare. Option A it is. It is hard to see but in that previous picture you can make out where (some of) the switches would connect (in the glare area to the upper right of the PCB). Shift register inputs along the left and bottom of that previous picture with some of the switch inputs on the right and how they are ‘mapped’. Note the common ground along the far right column of switch inputs. Colours were chosen to allow for relatively easy tracing if there was a problem. 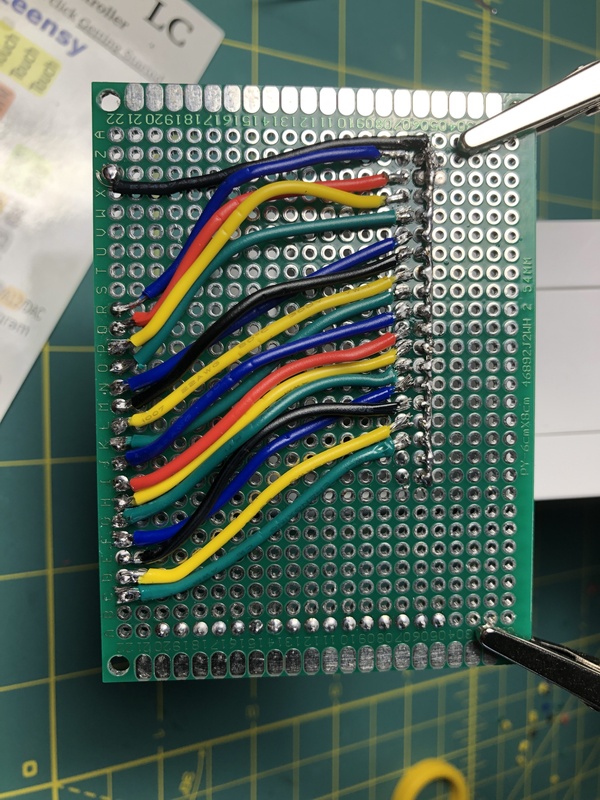 I did not take a picture of the completed breakout board and I really which that I did, but I think that you get the idea. Along the open space at the bottom right of the previous picture, all of the ‘three position’ switched had their inputs mounted - with a common ground. 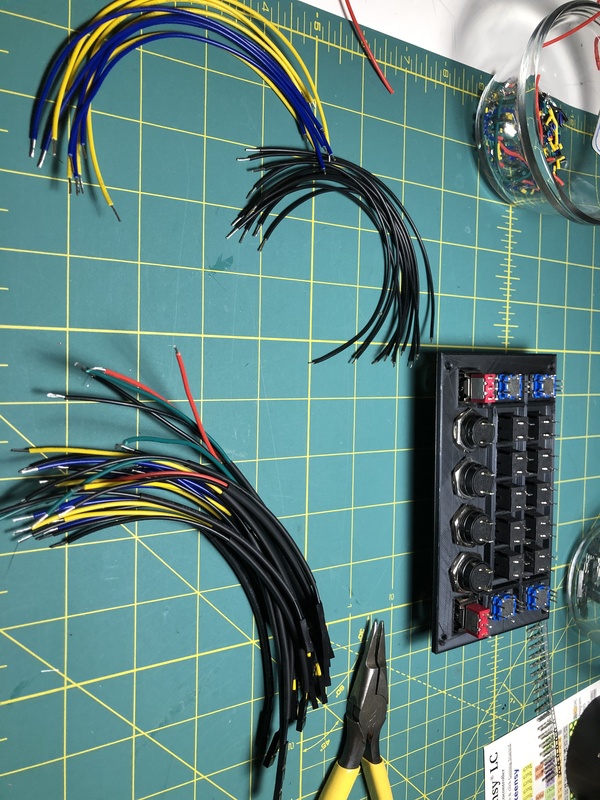 Let loose the Wire Kraken! 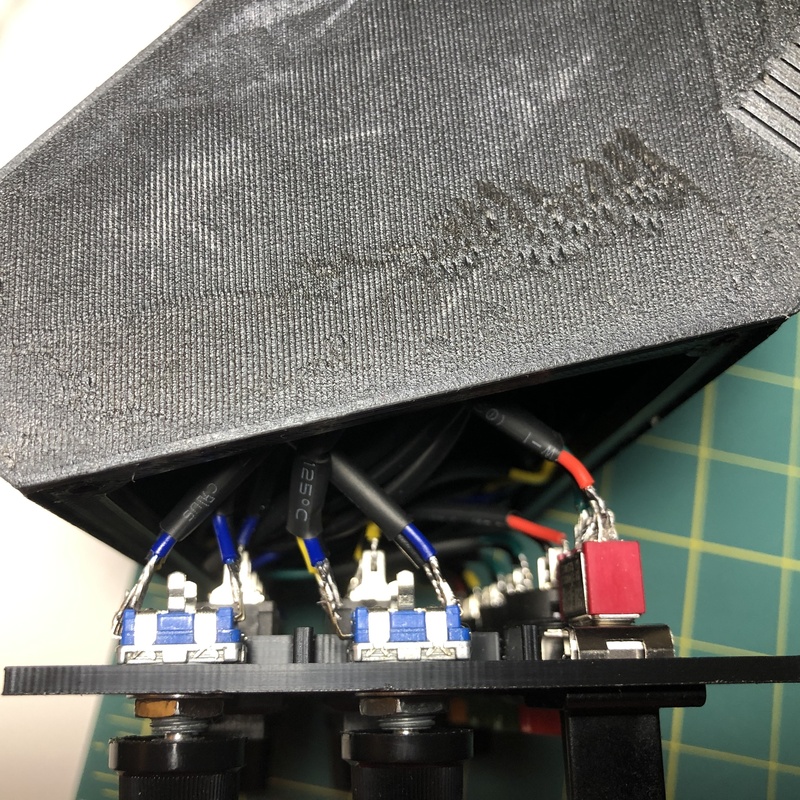 If you are astute you are now starting to question a design decision that I had failed to take into account from the beginning: How in the heck are all of those wires supposed to fit in the mouth of the box??? I did not take into account the space needed inside the box to accommodate all of that wiring! But the picture does not do it justice. That is one tight space. I managed to get it closed and I left it for a day to see if anything would ‘pop’. And after a day, everything seemed to be stable - no wires had torn themselves free and the screws did not pop free from the pressure on the panels.I did remove the panel and changing the heat-shrink on the rotary encoders to prevent them from shorting out, which you can see in the previous picture is a distinct possibility. 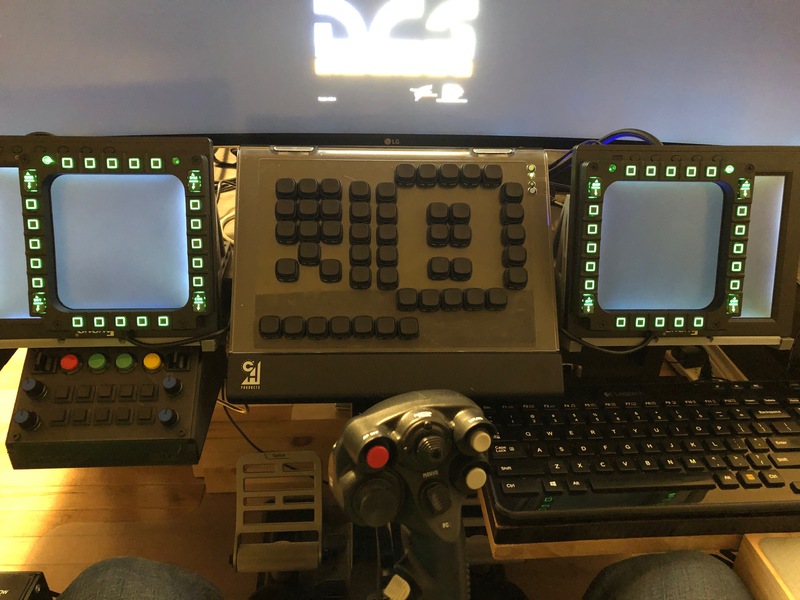 After attaching the whole thing to my PC and screwing the box into it’s permanent position in my cockpit setup (after having to take it all apart again to attach it to the desk), I went in to MMJoy and completed the mapping. And it is working beyond my expectations! 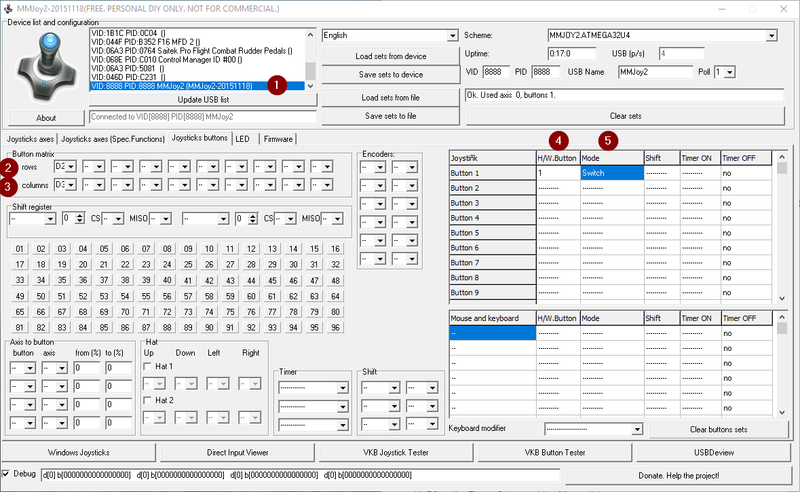 In DCS I have every button mapped to a function in the F/A-18C and it works beautifully! 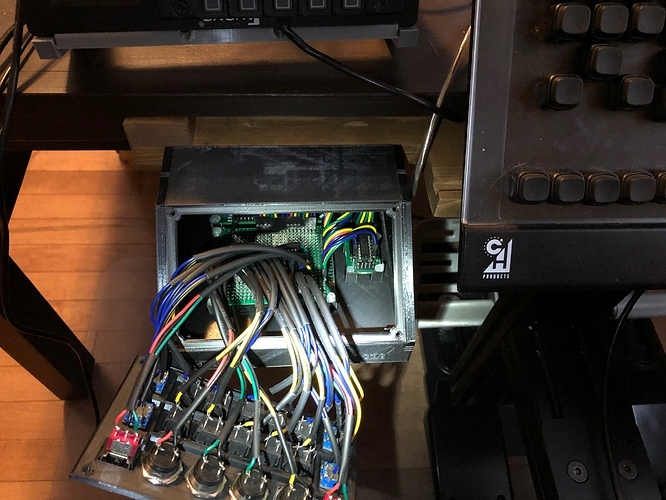 I full expect it to start to fail at some point, as I am somewhat concerned about the pressure that was exerted on the wiring to get it all in place, but for the past month it has worked with no issues! Again, I can’t thank @Troll enough. 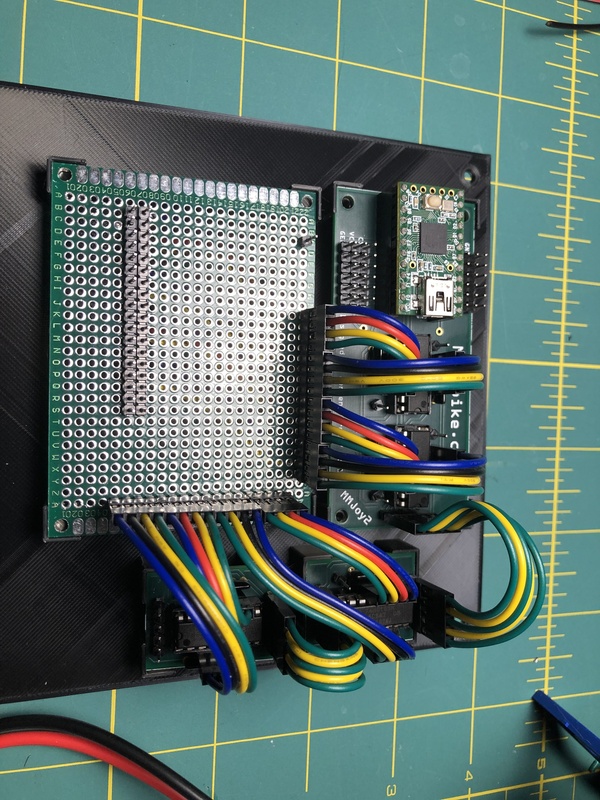 His patient help with the wiring and MMJoy and providing the main board and expansion boards was invaluable! The amount of time saved, let alone the potential frustration in trying to wire something like that up on my own, was monumental! Nice write-up and amazing job with the panel! This is the most elaborate and intricate April Fools post I have ever seen! I don’t get it. That looks really good @Fridge, plus a great post. Will you label up the buttons, or is there no need as you know what they do already? Very good write-up! This will help out a lot of future DIY’ers. I always fail to account for the wiring too… Takes up a lot of space, don’t they! Will you label up the buttons, or is there no need as you know what they do already? I thought about it but they have different settings for each module. 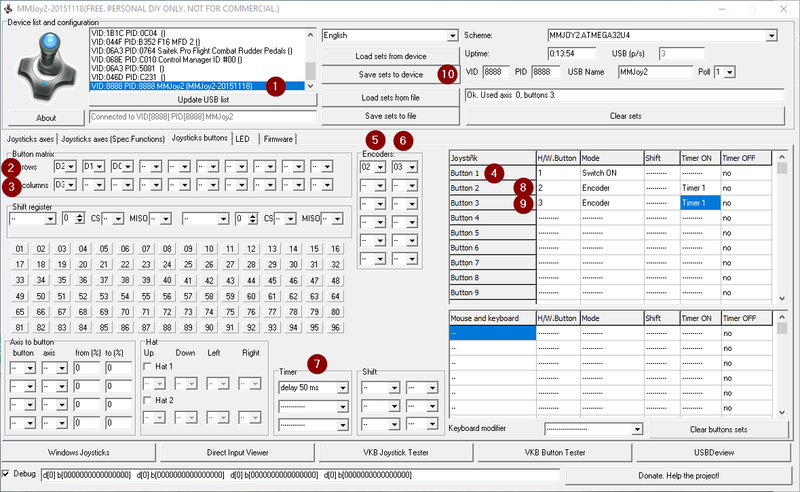 For the M2000C I see the 10 black buttons in the middle acting as frequency selection buttons but in the F/A-18C, the bottom row are for selective jettison. BTW: If anyone has questions or things that they would like clarified, please let me know. Thanks. She is the most curious of the two i have.